Conditioning Young Athletes is a solid, science-based resource for developing training programs for young athletes. • Recommended for: Coaches and parents of young athletes. Tudor Bompa, PhD is internationally recognized as an authority on athletic training principles. He is credited with originating the concept of "periodization" in strength-training programs when he introduced it in Romania in 1963. Dr. Bompa has personally trained 11 Olympic and world championship medalists, including 4 gold medalists. He has written 14 books on athletic training and these have been translated into 19 languages and are used in more than 180 countries. Currently, Dr. Bompa is a professor emeritus at York University in Toronto, Canada. Michael Carrera, MS is a certified exercise physiologist. He holds a Masters degree in exercise science. He has published 3 books and numerous scientific papers and has extensive experience as a sports conditioning expert. Carrera has developed wellness programs for numerous top corporations in Canada. He has also created more than 14,000 exercise programs for health/fitness websites. Conditioning Young Athletes is probably not a book you would read cover-to-cover. Instead, you would use it more like a reference book. Chapter 1 is an important chapter. It explains fundamental concepts and sets the stage for the rest of the book. Figures 1.1 (p. 5) and 1.2 (p. 8) illustrate that specialized training should not dominate until a young athlete reaches middle teenage years. Table 1.2 (p. 9-10) refines this concept by identifying specific ages when specialized training is acceptable for several dozen sports. This chapter is good though it seems some of the content here would be better suited for Chapter 2. The 2nd half of this chapter presents a variety of simple exercises and activities suitable for each of these 3 phases. This chapter is done well. The title of Chapter 3 "Assessing the Young Athlete" describes exactly what this chapter contains: 8 specific tests of various aspects of physical/athletic ability. This chapter is also done well. Chapters 4-8 present an extensive number of exercises designed to address specific training technics: flexibility, speed, agility, strength, and endurance. Accompanying these exercises are black-and-white photos of youngsters performing them. Coaches and parents can use these chapters to design specific training programs. Though Chapter 9 is only 9 pages long, it has an important message: young kids should not be pushed too hard too early. They should enjoy sports for the sheer fun of doing it. Competition should come later. Pushy, competitive coaches and parents should read this chapter twice! I've provided detailed comments on Chapter 10 below. Chapter 11 gets more academic: it discusses principles of exercise physiology. Parents will have a tough time understanding this content unless they have a science background, though, the flow-charts are helpful. Chapter 12 addresses training myths. There's good information here. However, while both authors have extensive scientific background, I would have appreciated a bit more documentation supporting some of the dogmatic statements they make in this chapter. • Photos & Illustrations: There are lots of black-and-white photos of young athletes demonstrating the various exercises. Generally, these are well done. Adding some directional arrows would make them even more user-friendly. • Tables & Graphs: The tables and graphs are generally done well. • Documentation / Accuracy: Though this is not a scientific book, its recommendations are based on published science. The authors list clinical research citations in a bibliography at the end of the book. 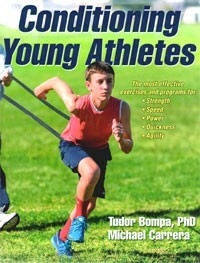 What I Liked About This Book: Conditioning Young Athletes is very thorough. Pretty much any coach or parent of a young athlete will find something useful here. I especially liked the discussion about not pushing young athletes too hard and allowing them to just enjoy sports for the fun of it until they get older. • There is almost no discussion of adequate calorie intake, and, no discussion whatsoever about ideal body weight or minimum body fat percentage in young athletes. ("BMI," "body fat," "body weight," and "percent body fat" do not appear in the Index either.) The discussion on calorie intake (p. 224) would be better if daily calorie amounts were provided in relation to the athlete's age and/or body weight as was done in the table for protein on p. 234. • On p. 225, the authors discourage the consumption of soda pop (which is always good advice! ), but the statement "...the acidic nature of soda can affect the alkaline balance of the body, causing inflammation and abdominal upset" sounds dubious to me. Soda pop is far less acidic than stomach acid itself. If the pH of whatever is in the stomach had a dramatic influence on our body's systemic pH, we'd have far more to worry about than soda pop! Further, the citation for this statement is a meta-analysis of the effects of high-fructose corn syrup on body weight...ie., is this the correct citation for this statement? A discussion of the effects of soda pop on calcium balance and bone density would have been more useful. • In the discussion of sports drinks (p. 237), the authors state "choose a brand that is relatively low in sugar." First, this is vague...how low is "low?" Second, one of the main reasons to consume sports drinks is to replenish carbohydrates. The carbohydrates in sports drinks are almost always simple, rapidly-absorbed carbs, which means some type of sugar. So, this statement is confusing to readers. It would be better to point out that sports drinks with a carbohydrate concentration higher than 6% should be avoided to prevent the development of GI distress. An adequate discussion of all these nutrition topics would make this chapter much longer, so, since this is a training book and not a sports nutrition book, it would probably have been better to just delete this chapter entirely. In summary, I think Conditioning Young Athletes is well-done. It is a useful resource for coaches and parents of young athletes. I can definitely recommend it. Copyright ©2015 AthleteInMe, LLC. All rights reserved.